Before you start cringing at the thought of summer shopping, pricy dinners, drinks and events, remember that you can save money while still having fun. If you make it a priority to save on the regular, you will have money in the bank for when you need it. Plain and simple! So here are 10 tips I follow to save when I can, so that I'm able to splurge when I want. Unless you need one specific item, don't settle for full price. Ask if stores have a student discount, sign up for mailing lists, and put aside some time to flip through the sale section. Where beauty is concerned, you really don't need to splurge on high-end face wash, body lotion, nail polish, mascara, etc. Visit Byrdie.com linked here for more Beauty Products To Save On. If your home is friend-friendly, become a pro hostess. Have your friends bring the goods and enjoy an affordable get together. Where dates are concerned, visit museums, theatres and art galleries on free or discounted evenings (student nights at the ROM, COC and AGO!) then get outside in the warmer months. With some quick Googling I'm sure you can find at least 20 free summer outings in the city. If you drink more water, everything will be better. Less headaches, more radiant skin, less chapped lips, longer life expectancy. Disposable water bottles are a massive waste of money, so keep reusable ones around and throw 'em into your bag. We have the best tap water in the world (IMO) so drink up! Especially in a big city, eating out can make your pay check disappear into thin air. Browse through Groupon in your spare time, sign up for restaurant email lists (free appetizers! birthday deals!) and never hesitate to *kindly* let your server know if a meal doesn't live up to your expectations. University students: use the gym on campus. Join group workout classes and don't buy an outside gym membership if you need to save. Also, never underestimate the library. I download hundreds of eBooks and audiobooks onto my tablet (for free!) from the Toronto Public Library Overdrive website. It rules. If you're organized, this can go extremely well. Just don't get carried away and start buying things you don't need, even if it's a great deal. Also, always keep your receipts for easy returns, price adjustments and refunds if something goes wrong. 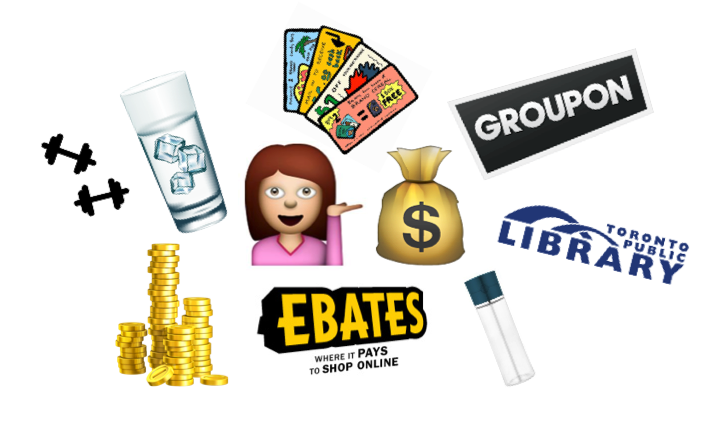 My favourite online shopping tool is Ebates.ca (referral) which gives you cash back for most online purchases when you access the online shop from the Ebates site. For the record, I've made $220 cash to date. Win. If you opt to drink when you go out, watch that green bill fly out of your hand faster than you can say tequila shots. Change it up and invite friends over for a board games night and make some drinks at home. If you're a pop drinker at dinner, go cold turkey and choose ice water. Your body (and wallet) will thank you in the end. Remove stains well, hand wash delicates, and store clothes properly. Instead of buying piles of cheap stuff, get some nice leather items and good quality basics. Clean leather shoes regularly (see my quick and easy routine here) and store bags and boots with paper or fabric stuffing to help keep their shape. If you do, they'll last for years. Head to the dollar store or a craft store and pick up some plain cards. With pretty pens, some glitter, and cute cutouts, you can have a stack of cards for only a few dollars. Head over to Pinterest and start getting some ideas, because everyone loves a gift that is a little bit personalized and a lot more thoughtful. Saving money is hard work. It will include planning, remembering, sacrificing and self control. In the end, it's so worth it since you'll be the one with money in the bank or that splurge vacation you've always dreamed of. Even something like $5 a day can give you a week of relaxation on a beach. Aw yeah.